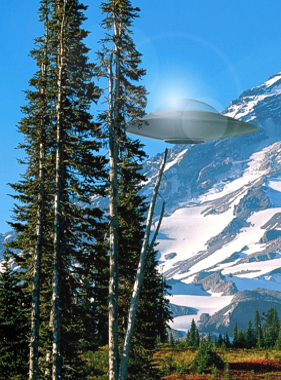 In ufology, the phrase 'flying saucer' was popularized by the media after Kenneth Arnold reported nine bright saucer-like objects near Mount Rainier, Washington USA on June 24, 1947. This was about four years prior to the introduction of the term UFO by Captain Edward J. Ruppelt. Today both terms are often used synonymously when referring to alien craft. However flying saucers are more accurately described as a subclass of UFO, differentiated from others by their disk-like shape and modest size, usually between 35 and 150 feet in diameter. On rare occasions miniature disks ranging from a few inches to a few feet across have been observed. On the opposite end of the spectrum disks 300 feet or more in diameter have been reported. RADAR operators have seen UFOs merge, leading many ufologists to conclude that most flying saucers are a type of reconnaissance or shuttle craft dispatched from an airborne carrier, in ufology jargon called a Mother Ship. Whatever the case may be, the configuration and performance of these UFOs has consistently been well beyond any Earthly achievement. For example, at the time this article was last updated, no known terrestrial flying machine could operate silently at high speed or radically and instantly change speed and direction. Some UFOs have been seen hovering silently, then instantly accelerate to great speed. They have also been seen instantly decelerating to a dead stop or even reversing direction while at high speed with no noticeable arc in their flight path. These performance characteristics strongly suggest an alien location is their ultimate point of origin. Although UFOs have the upper hand, human ingenuity has produced some remarkable aircraft, and those unfamiliar with cutting-edge military design have sometimes mistaken such craft for UFOs. For example, the Lockheed YF-12a interceptor has been used since the late 1950s for secret reconnaissance missions and has likely been the cause of some UFO reports.